Logvaar is a Nord warrior currently employed as a bouncer at the Jerall View Inn in Bruma. During the day everything is rather peaceful at the Jerall View, so Logvaar grabs the opportunity and spends the his free time away from work. At 8am, he heads to the Chapel of Talos and receives blessings from the altar of Dibella and will then pray until noon, seated on one of the available pews. After paying his respect to the Nine, he heads outside and strolls around town for the next four hours, preferring to stick close to the plaza in front of the Chapel. At 4pm, he returns to the Jerall View and begins his work, watching out for troublemakers until 8am. The only exception to this schedule is during the quest Defense of Bruma, when he heads outside and applauds Martin as he heads to the battlefield where the Great Gate will open. 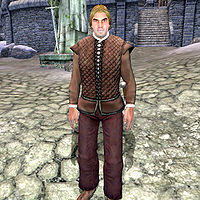 Logvaar wears an outfit composed by a quilted doublet along with a pair of burgundy linens and thick cowhide shoes. He is armed with an iron dagger to make his work easier and also carries around a moderate amount of gold. When you meet him for the first time, he will introduce himself and describe his job at the inn: "I'm Logvaar. Hafid pays me to stand around and keep things quiet." Logvaar values his job, saying "Nords who drink either get friendly or mean. I'm here to deal with the mean ones." Logvaar was supposed to sleep from 2am to 8am, but several errors prevent him from doing so: his 6pm-2am greeting is missing its duration so overrides his sleep, there are no unused beds in the cell he was told to sleep in, the available beds in the basement are all owned by Jerall View's publican rather than the inn's faction that he's a member of, and the beds are behind similarly owned locked doors. Esta página foi modificada pela última vez à(s) 00h38min de 19 de novembro de 2013.